The Locally Delicious Food Fund was established by a group of local women called the Heirloom Tomatoes of Locally Delicious, Inc., a nonprofit organization that supports the re-localization of the California North Coast food system and advocates for re-localization of food nationwide. They are the authors of the cookbooks Locally Delicious: Recipes and Resources for Eating on the North Coast and Lunchbox Envy. 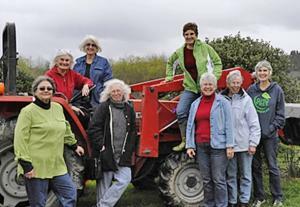 In 2010, the group established the Locally Delicious Food Fund with $3,000 of proceeds from the sale of their cookbook, combined with $3,000 in matching funds from St. Joseph Hospital’s Community Benefit Department. After presenting the funds to Food for People, the $6,000 was used to set up contracts with six local farms to grow fresh produce for food bank programs. 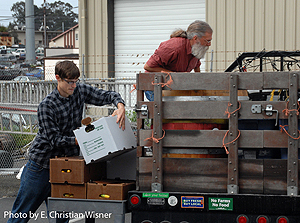 The result was over four tons of prime local, organic produce for the food bank, and much needed income for local farmers in advance of a rainy, unpredictable planting season. 2014 marked the fifth season of the program. The Heirloom Tomatoes continue to donate $3,000 yearly, while challenging the community to match (or exceed) their donation. Every year, St. Joseph Health System has responded to the challenge by matching their donation with a $3,000 gift, which is then added to donations from community members. 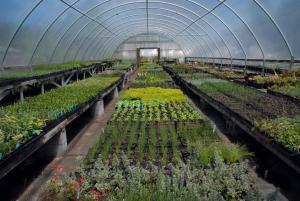 The amount of money raised determines how many farmers can be contracted to grow produce for our programs. Grant funds are provided to local family farms at the beginning of the growing season to defray seasonal start-up costs of production. 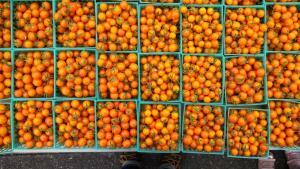 In exchange, farmers agree to grow a specific crop for the food bank that season. Priority is given to smaller farmers who can use the funds to expand their level of production. Food for People works with these farmers to select crops that provide a diversity of produce for our programs throughout the growing season, and we put care into choosing items our clients would be able to use and enjoy. Produce provided through the program this season will include lettuce, kale, Swiss chard, broccoli, summer squash, cucumbers, tomatoes, eggplant, peppers, beets, kohlrabi, winter squash, leeks, turnips and herbs. Access to fresh, nutrient-dense local foods helps promote health and increase fruit and vegetable consumption for the people we serve. Many clients are excited and inspired to try new foods and recipes, and our Nutrition Education and Outreach team offer great resources, tips, and ideas on how to prepare these foods in a tasty and healthy manner. The benefits of the Locally Delicious Food Fund extend well beyond the people we serve. Our local farmers benefit by receiving income at the beginning of the season when they need it most, stimulating the local agricultural economy. In addition, arrangements like these help support more localized food production and small, organic family farming operations that work hard to produce food for our communities. Food for People benefits as well through strengthened relationships with farmers who think of us when they have extra to donate, and know we’ll put it to good use. The Locally Delicious food fund more broadly helps bridge the gap between food insecurity and local food sources in Humboldt County, which benefits the entire community. We would like to thank Locally Delicious and the Heirloom Tomatoes for their ongoing support and enthusiasm for this program, as well as St. Joseph Health and all the contributors to the Locally Delicious Food Fund. To contribute to the Locally Delicious Food Fund, make your online donation here and select “Locally Delicious Food Fund" in the designation line. Receive a complimentary copy of Locally Delicious: Recipes and Resources for Eating on the North Coast with a donation of $50 or more. Please contact us to let us know where to send your copy. To donate via phone, by check, or in person, call Food for People at (707) 445-3166 ext. 306 or mail a check to Food for People, and be sure to mention the Locally Delicious Food Fund. To learn more about Locally Delicious (seen in photo at right) and their work, click here to visit their website.